Richard Browne, Director of L&M Keating has been awarded the prestigious the title of Engineers Ireland, Chartered Engineer of the Year for 2015. 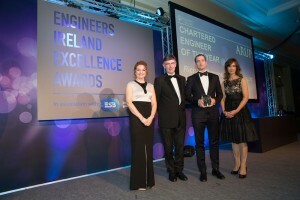 The accolade is Engineers Ireland’s most prestigious individual award. Richard was shortlisted from over 500 Chartered Engineers across all engineering disciplines in multiple industries and organisations throughout the country. Richard was unanimously declared the winner by a panel of 4 judges in an intense final round of interviews and presentations held last month in Engineers Ireland headquarters at Clyde Road, Ballsbridge. The announcement was made at the Engineers Ireland Excellence Awards ceremony in the Intercontinental Hotel, Dublin on the 6th November 2015. In his address to the 400 delegates at the ceremony Richard outlined the challenge of ensuring this 1000t chamber ‘arrived on the right day, at the right stage of the right tide, with the right weather conditions to slot the chamber into exactly the right spot a two hour tidal window. ‘I’m thrilled with the win, it’s fantastic recognition of the hard work our team do here at L&M Keating. We have great people delivering really innovative, challenging building and marine projects throughout the country and we don’t shout enough about it!’ Richard said.